À Travers Chants, is about thirty choristers of men and women, with 4 part harmony, 40 songs in 10 languages, more than a hundred hours of rehearsals per year. It is also about sharing, conviviality, solidarity, demand and a concern for quality in its performances. For thirty years, this vocal ensemble sang predominantly French songs. It met regularly in Aigrefeuille, under the direction of Henri Dubois. 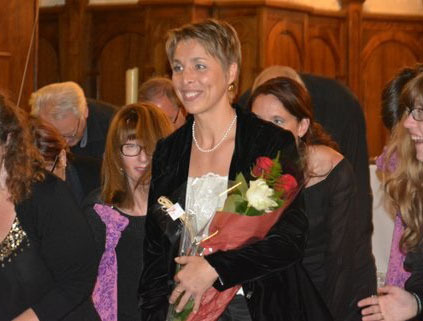 In 2012, the choir took a new turning point with the arrival of a new choir director, Svetlana Juchereau. Under her direction, the repertoire has expanded with international and gospel songs. 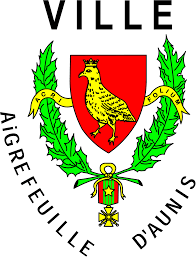 The rehearsals are held alternately at Aigrefeuille and La Jarrie, once a week on Monday evening. If you like to sing, and even if you don't know how to read music, come and meet us and try a rehearsal. Svetlana Juchereau, now Aigrefeuillaise, trained in the Culture University of Minsk, capital of her native Belarus where she specialised as a choir conductor. She now directs several choirs in the Rochelle region, including À Travers Chants. Svetlana also pursues her career as a singer, as a mezzo-soprano in the vocal ensemble of the Abbaye aux Dames de Saintes. Finally, she holds a Diploma of Musical Studies of lyrical singing obtained in the Nantes Conservatory of music in 2015, and as "singing professor", she welcomes you. The men's choir "OK choral" is composed of 11 choristers who interpret gospel and traditional songs, mainly during civil ceremonies. Their weekly rehearsal takes place in L'école de musique in Aigrefeuille every Thursday from 3pm to 4.30pm.